ADHD is a ubiquitous diagnosis these days, probably because the criteria is so subjective. If a child wiggles a bit too much in their seat, they have ADHD. If they look out the window at school, they have ADHD. Hair won't stay combed? ADHD. It gets weird after awhile. I deal with kids with ADHD every day. It gets exhausting, mentally trying to keep up with some of them, and at the end of the day, I am glad that I get to go home to peace and quiet. Except that I don't. I myself do not have ADHD, but I live with ADHD. There. I said it. Both of the men in my life have ADHD. A central fact of my life, one that has brought me much joy, and much exhaustion. Here is just one example, and you may point and laugh, if you like. Sunday we were all sitting in the living room. The lights were out, the blinds closed against the heat. 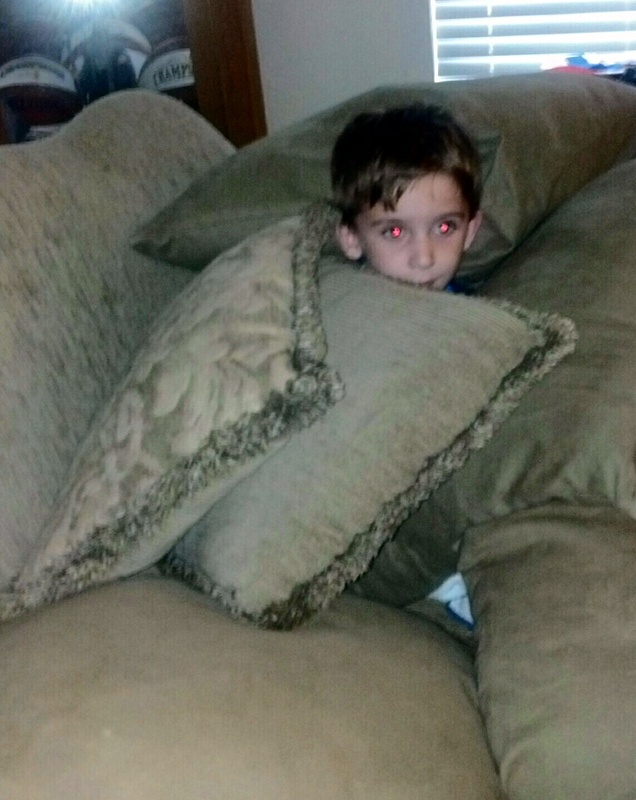 Zane was ensconced in his Boy Nest, which is the equivalent of a Man Cave. It is a nest of pillows that takes up the entire loveseat. I think that he likes the pressure of the pillows on his body. But he'd been in there all day, and the house was a mess. Sorry, I didn't get a chance to get rid of the red eye. "Hey Zane, please pick up your toys off the floor before somebody gets hurt." I told him. I was quite proud of myself for not mentioning that I'd already stepped on several hard and sharp toys that day. I'm Catholic, and I know how to ladle on that guilt like gravy, but I refrained. Best to pick your battles. Zane started to pick his toys off the floor. He did. Compliance is never an issue at our house. But then he had to play with the dog, roll around on the floor, jump off the couch, have a snack, comment on the Chicago Fire soccer game that was on TV, ask for the 4000th time how old his Uncle Jim is, and other stuff...all in ten minutes. I found myself in a futile battle to do what a parent is supposed to do, which is redirect. That's what all the books say that you're supposed to do, and I've read all the books. "Zane, you're supposed to be picking up your toys." "You're supposed to pick up your toys." To be fair, every time I redirected, Zane did pause to pick up a toy. Sometimes he even moved in the direction of the toy box. Mostly he put it back down, because he was distracted by the dog, Wimbledon results, a commercial about slow turtles, the soccer game on TV, who was playing in the Gold Cup(some soccer thing), and whether or not he could be invisible. My voice did get louder and louder, and Zane ratcheted up HIS voice to match mine, while Maisy jumped around us, as if encouraging us to fight. In the midst of our melee, we hear singing. "Oh the Chicago Fire, they are a really good team...hmm hmm..."
Zane and I just stared at Larry. "Uhhh...what was that about?" I had to ask. "I don't know, just pretend I never did that." he said. "Okay." Zane and I said. Yes, this is an ADHD household. And I wouldn't trade it for anything. Except an occasional nap. Zane needs to make his boy nest bigger so you can steal a few zzzz's in there! I live with it as well. SO much so that Oldest was walking out into the street at 5 because he was so distracted by other things he forgot to look. I chose to use low invasive meds for him and they work fine for the most part. He still needs to wiggle or stand during school, and needs redirection a lot to stay on task even at 12.